Today we started making the earthship side of the outhouse. 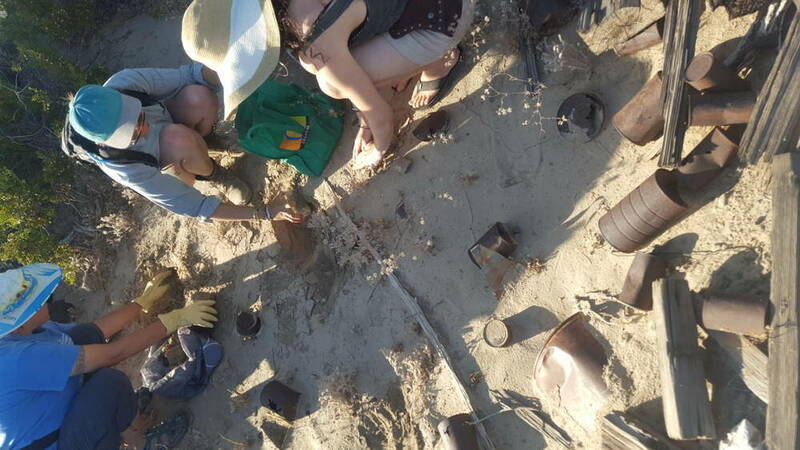 We filled as many bottles as we could with plastic bags and sand from the ground. This actually took the longest and required help from the whole group of eight of us to fill bottles for days. 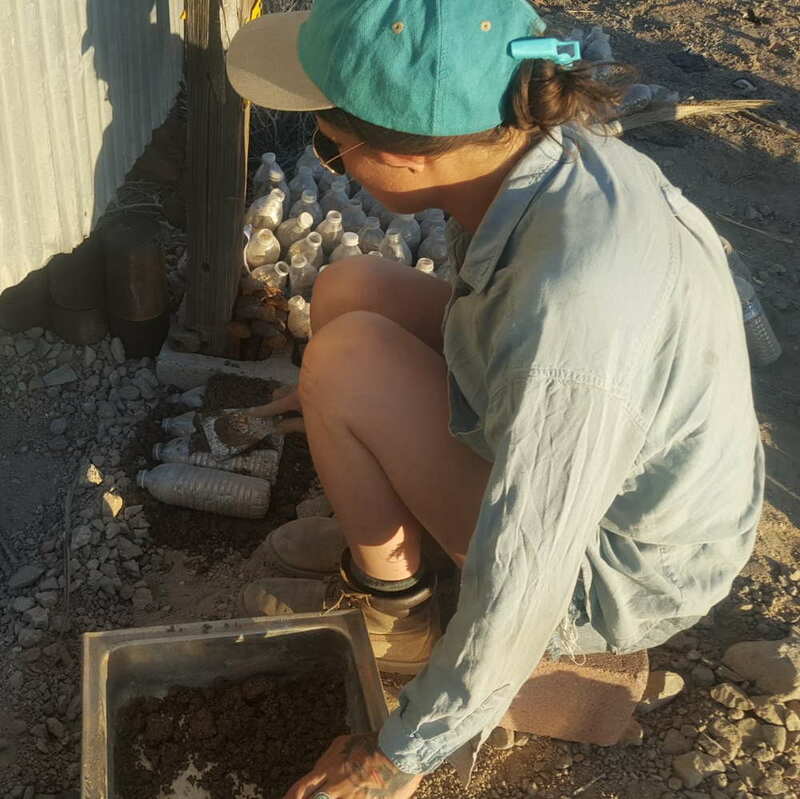 Earthships traditionally use cement but we wanted to use something greener since cement creation creates so much pollution. We wanted a sustainable material we could source locally. BCC: taught us how to make a type of building material made from sand and clay we found in the desert. 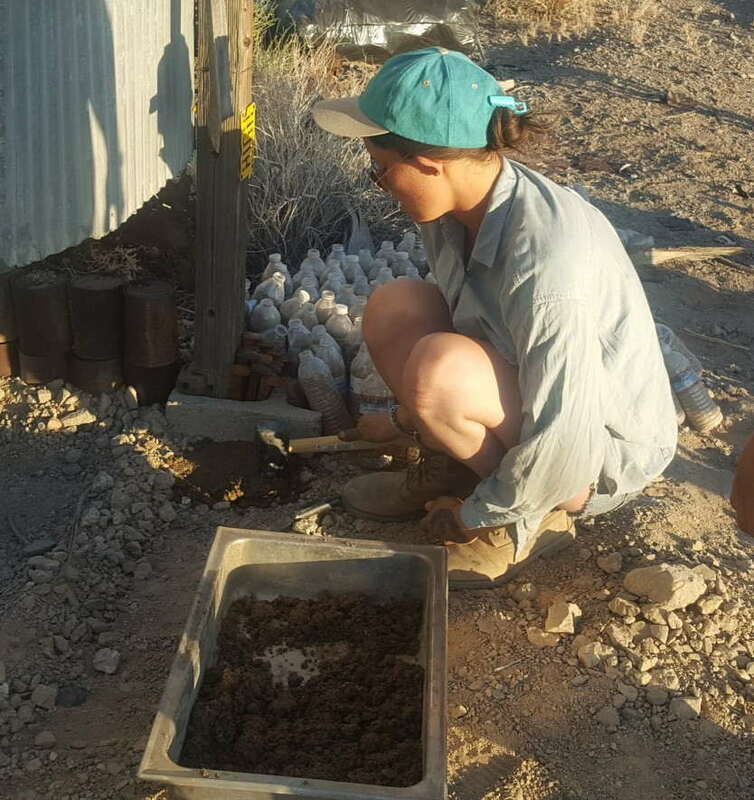 The method she used was a hybrid between rammed earth, which uses more pressure and less clay and water, and Adobe which uses less pressure but more clay and water. 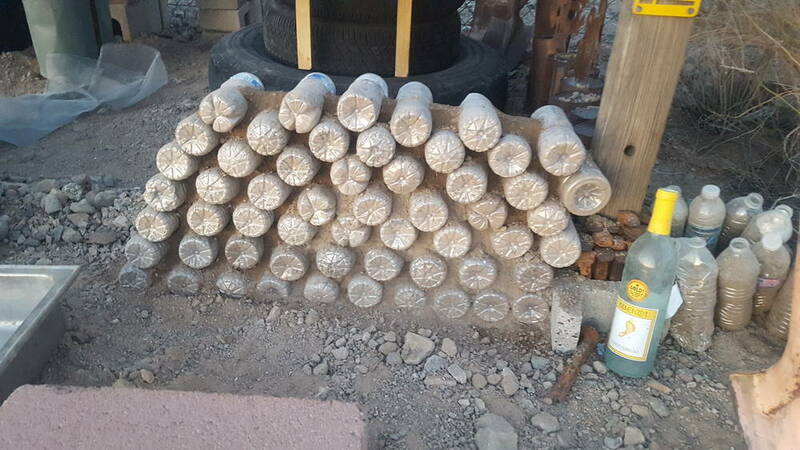 Rammed earth would use 70% sand and 30% clay, where Adobe would use all clay and lots of water. Our sand was very dry so we decided to use about 50% clay and 50% sand. 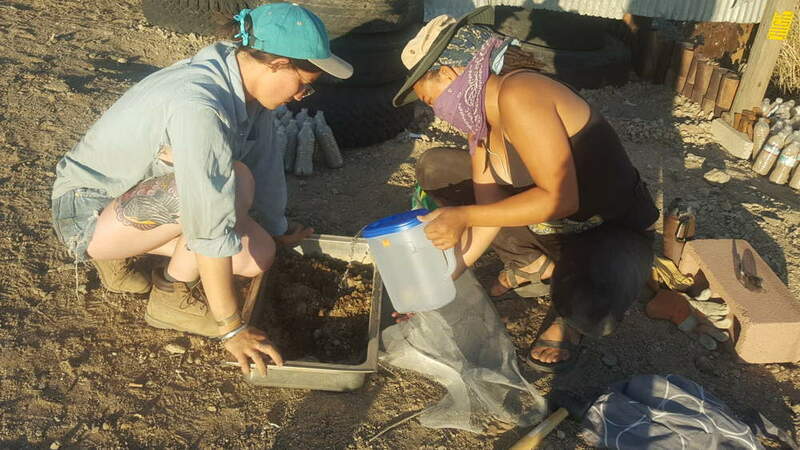 We sourced the sand and clay locally, in order to find out the right type of material we tested it using a sedimentation test. We reused an old honey jar filling it up with half of the dirt we wanted to test it with. We filled the other half with water, shook it for a minute and then let it settle. 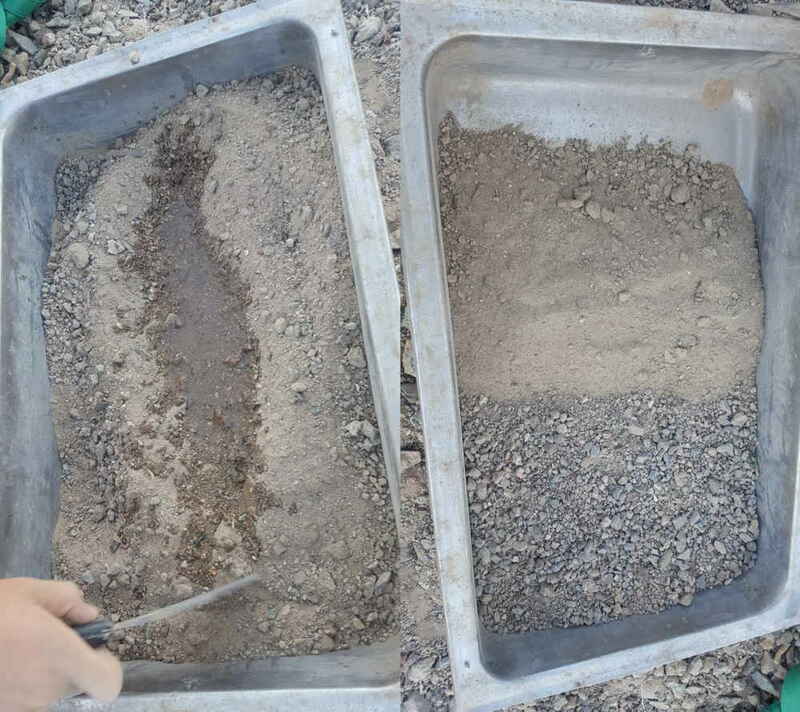 The different layers of the soil will settle based on weight after a few hours (works best if you leave it for 12 hours but if the sand is heavier that is not necessary). Based on how the dirt settled tells you what type it is. 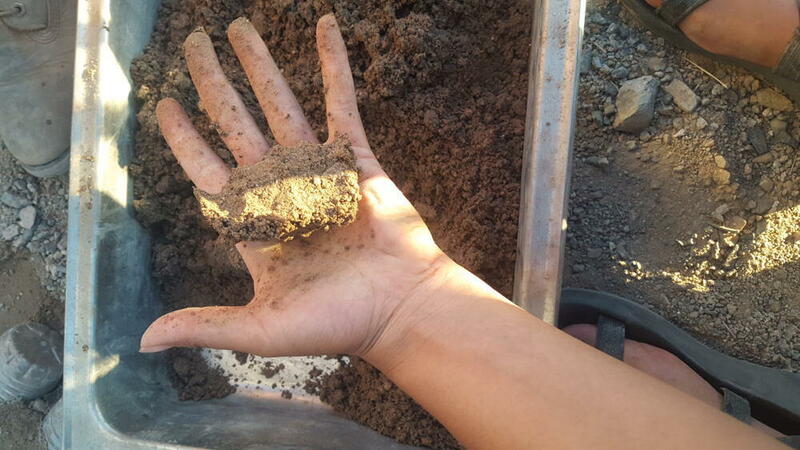 The clay will sit on the top and then silt and then an organic layer (if there is one), soil, sand and then gravel. 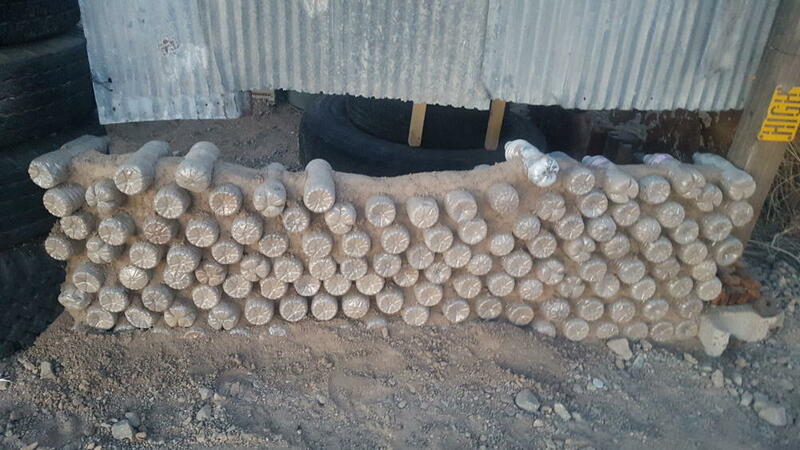 Based off this we used sand and clay to make the building material. We split the sand and clay 50/50, and added only a little water so it was damp, not wet. To tell if the soil is at a good amount of moisture, we squeezed it together and saw if it held. We layered the plastic water bottles using the bottles like bricks with the earth like cement. We started with a layer of earth on the ground and built it up, laying the plastic bottles on top of each other with earth in between. Then we used a mallet to press the earth between the bottles, this had to be gently but firmly since because we used old plastic bottles they were brittle from being out in the sun and could crack. Also, the gentle part cannot be stressed enough, the first time we finished I was pressing it too hard and not putting enough earth between each one, and my whole side collapsed and we had to start over on that side! We also found that it helps if you only do a row or two at a time and let it dry in between. The wet earth doesn’t hold very well until it dries. It was super awesome to be able to source this project completely out of manmade and natural materials found in the desert. It felt like it was a way of stepping lightly on the land we are living on. Loved the detail on testing your media. Nice to read about practical stuff.